A pair of recent stadium giveaways celebrating two 1990s legends are creating a lot buzz in the hobby as out-of-town collectors try to track them down. The first is a Roberto Alomar bobblehead doll that was handed out July 31st in Toronto as the Blue Jays took on the Texas Rangers. Alomar, who was just inducted into Cooperstown, was having his number retired by his former club. 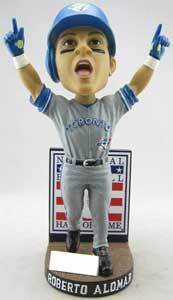 The first 20,000 fans at the game were given the collectible, which features a cheering Alomar pointing toward the sky in celebration. The Baseball Hall of Fame logo is in the background. The bobblehead came packaged in a box picturing the former second baseman in the same pose. 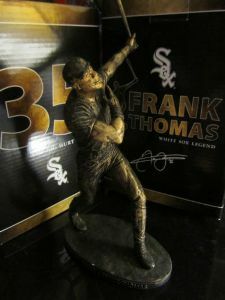 Another giveaway causing a stir is a Frank Thomas mini statue given out by the White Sox, also on July 31st. The mini statues replicate the life-sized version of the slugger that was unveiled by the club at Chicago's US Cellular Field. The collectible statues were handed out to the first 20,000 at the game. They feature a bronzed Thomas in his trademark follow-through swing. The mini statues came in a sleek black box highlighted by Thomas' name, number and facsimile signature. Both giveaways are readily available online, but the limited nature of the regional distribution should make them harder to find at reasonable prices as the initial supply dries up.